A little over a third of 2010 is in the books, so here’s an update on my anti-resolutions (aka goals) for 2010. This year it is all about changing habits, starting with eating breakfast. I’ve never been a breakfast eater, at least not a hop out of bed, eat a bowl of cereal breakfast eater. I have to move around awhile and would rather have my breakfast later. I started taking my breakfast to work – usually a piece of fruit and reduced fat peanut butter on a slice of toast – and munch on it around 9:00 or 9:30 in the morning. Another goal was to start brown-bagging my lunch so I would eat a better and more healthy meal. This was easier than I thought it would be and so far I’ve only had to buy my lunch twice this year. I also wanted to exercise more – at least three times a week. I joined a gym and have done pretty well meeting the three times a week and almost enjoy it – almost. I’m not having so much success with getting up earlier. I’d really like to get my day going around six each morning and go to the gym and walk the dog before leaving for the office. Right now I’m getting the dog walked but haven’t been able to make it to the gym in the morning yet. I’ll have to keep working on this one. Another goal was to waste less fresh food. A typical scenario is my buying food to prepare three or four dishes, but the reality it, I could only one or two dishes, and beautiful fresh food (usually vegetables) goes to waste. That’s crazy – a total waste of food and money. I get flashbacks of my mother telling the starving children story every time I toss out a bunch of celery. So tonight, with no plan, I looked in my fridge to see what was on the verge of despair. There was about a cup of cream nearing expiration, leftover mesquite grilled chicken, and on the counter two ripe avocados. 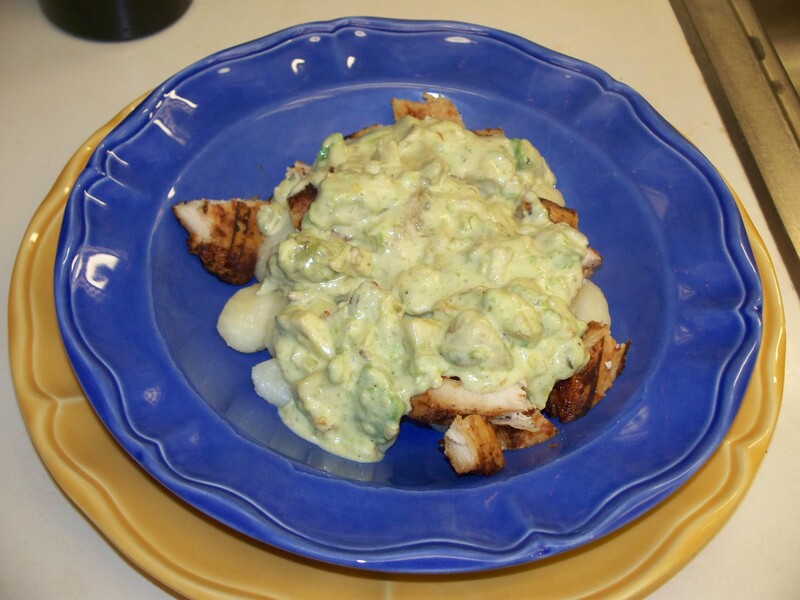 The result was Gnocchi and Mesquite Grilled Chicken with Avocado Cream Sauce. And it was good! Melt butter in medium sauce pan, add onion and sauté until onions are translucent. Add a little freshly ground sea salt and pepper, then the cream. Reduced the heat and let the cream reduce by about a third. Bring a medium sized pot of water to boil. Add potato gnocchi (of course any pasta will do) and a little sea salt. While the gnocchi cooks, slice the chicken breasts into half inch pieces. Split and pit the avocados, then spoon the meat out of the purplish leathery shell and just dumped it into the cream and onion mixture. Slice the avocado meat in irregularly sized pieces with the spoon while in the pan and stir. Some of the smaller pieces will dissolve into the sauce while the larger pieces remain intact. Serving is simple – in the bottom of a wide bowl spoon the gnocchi, then place the chicken on top, and covere it with the avocado sauce.